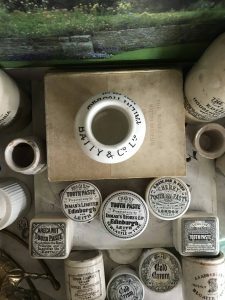 This very Rare Pot curated at the National Bottle Show this July 2018 from a dealer who had many clean pots from the late 1800’s and only brings his wares to this famous show each year. 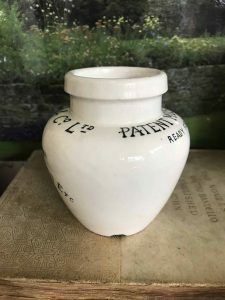 There are only a few signs of age on this beautiful pot — light crazing and a small chip as pictured on the base. Super rare and one of my personal favorites. 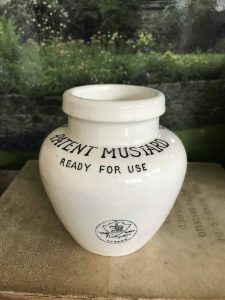 Displays well and looks wonderful displayed with other French and English Advertising Pots, old books, ironstone, etc…. 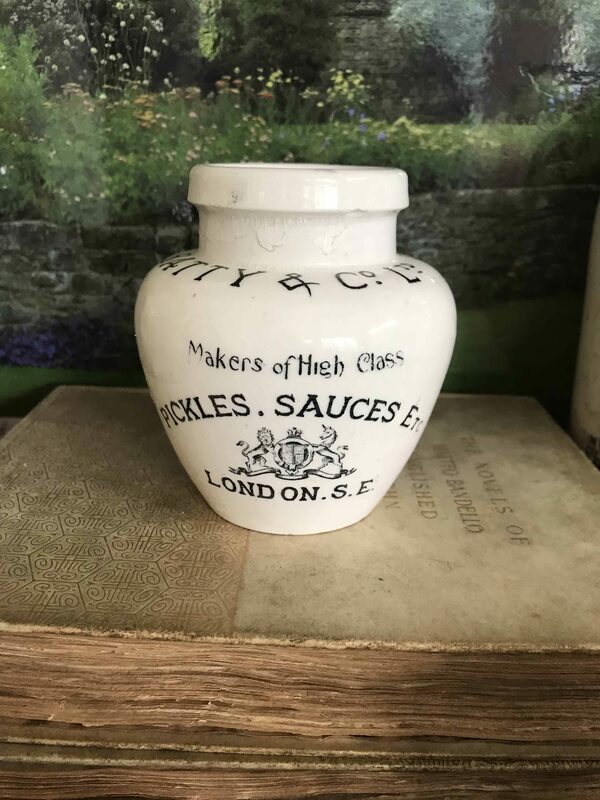 Batty & Co of London was a pickle and sauce manufacturer. The business was acquired by Heinz in 1905 as part of their entry into the British market. George Batty (1800 – 1874) was born in Broxbourne, Hertfordshire, to a family with South Yorkshire roots. He moved to London and founded Batty & Co in 1824. Four years later he married Eliza Feast from Cheshunt, Herts. Batty had acquired the recipes of the late Dr William Kitchiner (1775 – 1827), an eccentric but popular celebrity chef of the era, by 1834. Batty & Co produced Dr Kitchiner branded sauces, such as Salad Cream. Batty formed a partnership with Robert Feast of Waltham Abbey, Essex, and they traded as Batty & Feast from 1836. Feast was almost certainly a relation to Batty through marriage. The merger combined Batty’s factory at 101-2 Leadenhall Street with Feast’s premises at 15-16 Finsbury Pavement, which were used as offices. Batty & Feast employed 86 people by 1851. The firm rivalled in size Crosse & Blackwell, which employed 126 people. Batty & Feast won the only prize medal for pickles at the Great Exhibition of 1851, held in Crystal Palace. It was reported in the press that Queen Victoria showed a great interest in the Batty & Feast stand. The partnership was dissolved by mutual consent in 1852, with George Batty taking on all liabilities. Feast retained the Finsbury offices, and Batty relocated his offices to Leadenhall Street. Batty decided to concentrate on the export trade, particularly Australia. An independent examination in 1855 reported that Batty & Co “India Soy” comprised of “little more than treacle strongly flavoured with salt”. This was common practice at the time, but undoubtedly the company did not enjoy as high a reputation as Crosse & Blackwell. The company was fined five shillings plus costs for selling short measures of its products in 1867. Batty & Co employed 110 people by 1861. The company produced around 80 tons of isinglass, made from fish and used for clarifying beer, in 1862. Batty & Co employed between 50 and 100 men in 1871, the exact figure varying with the season. The company’s best known products, Nabob Pickle and Nabob Sauce, began to be advertised from the 1870s. The company claimed to have been the first to bottle calves feet in jelly, a popular product at the time. Batty & Co declared bankruptcy in August 1874, with £34,000 in liabilities (£3.5 million in 2015). The company’s assets were said to be of “very considerable value” in The Times. George Batty died in October the same year. 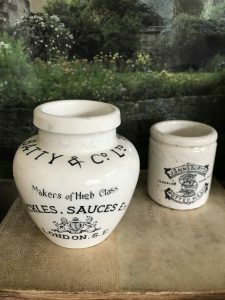 The business was acquired by Slee, Slee & Co, vinegar manufacturers of Southwark, and Batty products remained in production. In the late nineteenth century Batty & Co built a factory in Peckham. It had 38,000 sq ft of covered space and 33,750 sq ft of open space. The premises included a number of railway arches, 17 for storage and two for processing. George Batty’s son established a similar business, Henry Batty & Co, in Edinburgh, which emerges from the 1890s, but did not appear to survive for long. 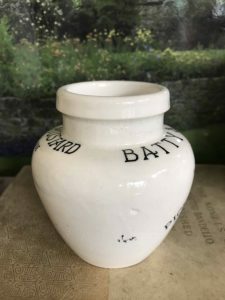 Batty & Co was incorporated as a limited company in 1901. In 1905 the company was acquired by H J Heinz, who wanted a British manufacturing base. The Batty brand was phased out in 1910 and its products were rebranded under the Heinz banner. The Batty brand survived for a few years longer in export markets.